Today, I worked on a puzzle design for the game, where you have to enter a sequence of numbers accompanied by directions to turn a dial on a safe. It was originally meant to be a test, but the design worked so well that it’ll probably work its way into the final product as it is, accompanied by some illustration though. Right now, it’s just a text box convincing you that you are in fact turning the dial on the safe. I worked on integrating the first draft of the dialogue trees into the game as well today, which turned out to be a pretty painless task. I tested my way to where to put line breaks so that the dialogue lines didn’t become too long. I also integrated the dual perspective dialogue tree into the game, where you control two different characters and their responses. I was afraid it would be too confusing at first, but it turned out to flow pretty smoothly. There’s only a pair of choices for the second character, so I might try to break up the dialogue into a few more choices to make the player more involved. After all, the lines that are currently in the game are just from the first version, I suspect there’ll be a few things to change along the way to really get all the emotion and character traits in there. I also worked on a background today, trying out a new style. It involves both 3D modelling and 2D painting, a mix of both worlds, so to say! This is what’s in the game so far, visually. 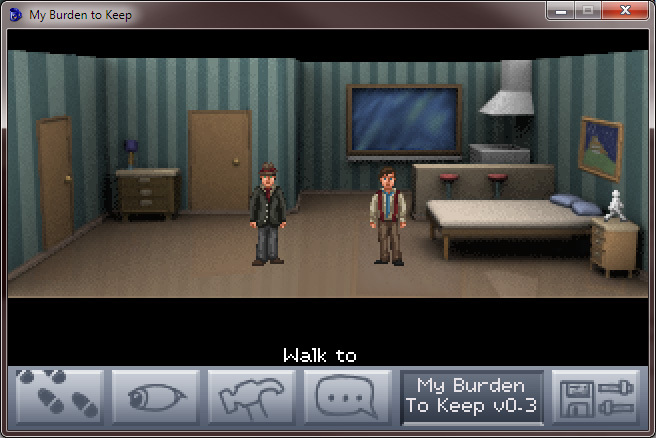 Please note however that the characters are just placeholders I did way back for the prototype. That’s all I have for today. Tune in tomorrow for another episode of ‘Adventure Game Development Shenanigans’! Or, you know, come back tomorrow for another semi-interesting blog post?